Believe in the Impossible. We recently featured an international trailer for Ang Lee's magical-looking new film Life of Pi, now we have another beautiful international poster to go along with it. This one comes from Facebook, specifically 20th Century Fox Portugal, where they have unveiled a rather impressive mosaic artwork quad poster for Life of Pi, featuring the tiger front and center. Pi Patel, played by Suraj Sharma, is on there, but in many of the smaller images, scenes from the film, that make-up the bigger image. I love what it represents in terms of a bigger story in this, I love it's simplistic beauty; good work Fox. Keep it up! Life of Pi is the story of an Indian boy named Pi, a zookeeper's son who finds himself in the company of a hyena, zebra, orangutan, and a Bengal tiger after a shipwreck sets them adrift in the Pacific. 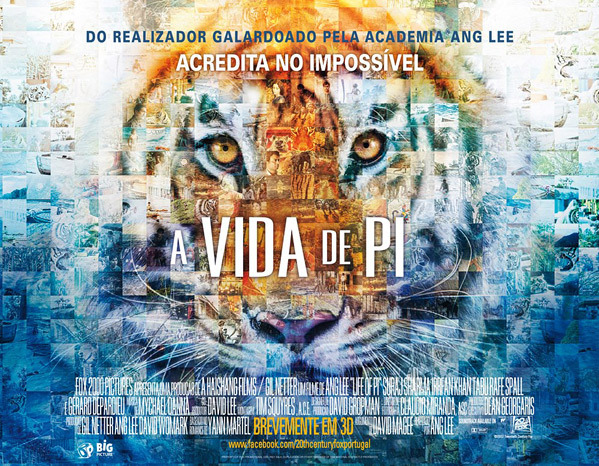 Life of Pi, based on Yann Martel's novel, is being directed in 3D by Oscar winning Taiwanese filmmaker Ang Lee, of Taking Woodstock, Lust Caution, Brokeback Mountain, Hulk and Crouching Tiger previously. The cast includes Irrfan Khan, Adil Hussain and Tabu, in addition to the animals and Pi, as it also looks like there's quite a bit going on in this. Fox has Life of Pi scheduled for a wide 3D release on November 21st. Latest trailer.